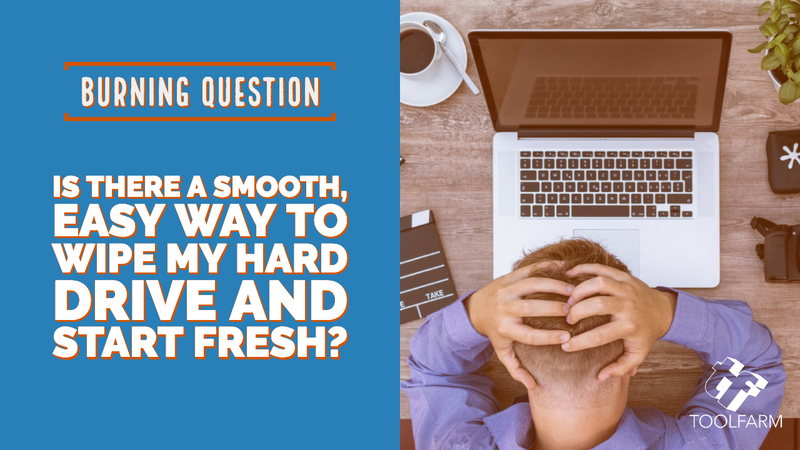 Burning Question: Is there a smooth, easy way to wipe my hard drive and start fresh? There comes a time in every artist’s life when buggy software, sluggish processing, crashing, or whatever, just become too much. It’s time to wipe my hard drive and start fresh. Note: The tips about deactivating and reactivating licenses below are also very useful if you’re moving to a new computer. How can I make sure this is as smooth of a process as possible? We’ve all been there. I feel your pain. Whether you’re wiping your old drive to reinstall everything, or wiping it because you’re getting a new machine, here are some steps you can take to make this an easier process. Hot Tip: If you’re on a Mac, here’s a useful checklist for reformatting your Mac from Asian Efficiency. This is SUPER useful. Backup everything. Get an external drive that is large enough to back up all of your content, or at least back up any important files. Use a program like Time Machine on the Mac. Some hard drives come with backup software too. Some people back up to the cloud. It took me 17 hours to backup to a USB drive last time around, so I can’t imagine how long it would take to back up to the cloud! Acronis True Image is one I’ve heard about but I haven’t tried it but it’s getting excellent reviews. You may be best just manually backing up your computer. There are a lot of resources online for that. Here’s a guide for Windows. Here’s some help for backing up your Mac. Collect serial numbers and software keys, as well as usernames and passwords. Make sure you have copies of all of your serial numbers and software keys for software that you’ll need to reinstall. Print it out if you have to or create a text file and back it up to your external drive or put them on the cloud in a safe place. You don’t want to have to go digging around for serial numbers. You can use password saving programs like 1Password or Keychain and then back that data up to your external drive and install that first. Make a list of your software applications that you want to reinstall. This will just make it easier to keep track of what you need. Make sure you have serial numbers, software keys, and account usernames and passwords for reauthorizing. Deauthorize or unregister applications. Because it will look like a new computer, you’ll want to deauthorize anything that may give you trouble. Here’s a list and we’ll add more as we have them. Apple App Store Downloads – You only have 5 authorizations for your Mac, so deauthorize your computer with iTunes. You’ll also want to deauthorize iCloud. Autodesk – Transfering your standalone licenses. You can also deactivate a license remotely if needed. Avid – Deactivate your software before wiping the drive. Prior to deactivating, make sure you have a record of your system ID and activation ID. See: How to move an Avid software license from one computer to another. Even though you may not be moving to a new computer, there are a lot of helpful tips here. Boris FX Products – Deactivate your software before wiping your drive. CoreMelt – Deactivate your plugins using their license manager. Here is a video tutorial and the license manager download. DragonFrame – Deactivate before you wipe your drive. You’ll need your serial number to reactivate through their website where they’ll give you a new activation code for when you’re ready to reactivate. FxFactory – Here’s a video on how to activate and deactivate Fxfactory plugins. KeyShot – Deactivate your license before wiping your computer. Maxon – Deactivate your license before wiping your drive. Maxon permits Cinema 4D users who have a valid Maxon Service Agreement (MSA) can install their license on a second device (for example, on a desktop and a laptop). However, the simultaneous use of both installations is not permitted. Microsoft Office – Go to your account page to uninstall it. RE:Vision Effects – Deactivate your key-based license (issued from December 2018 or later). For purchases before December 2018, which use an old-style key of 16 characters, write to sales@revisionfx.com to get a new key. If your software version is a full version back, you’ll need to pay for an upgrade. If it’s a point update away, they’ll send you a new key for free. Please let us know if you have questions about this. Steinberg – Deactivate before wiping. Instructions here. Telestream – You need to deactivate the license before wiping, then reset your serial number. Check the License FAQ for more information. Video Copilot – Delete the plug-in from the machine and re-install and re-license on the new machine or newly reformatted machine as before. Wipe and reformat your computer – Even if you’re giving your computer to your kid or the neighbor, it’s a good idea to completely wipe and reformat it. Bad guys can use clever techniques to extract personal information from a drive. If you don’t believe me, Read this before you sell or recycle your computer! They found all sorts of goodies on recycled computers including social security numbers, medical records, and business plans. Install software. Install all software and plug-ins that you need. Reinstall content. Restore your content as needed from your backup. You can create a bootable backup of your OS from a USB/SD card or HD in case of a problem. I’ve had to do this recently due to some malware that I stupidly downloaded. Here are instructions for Windows and Mac. Related: How to get your Windows Product Key– Download a script to help with this process.